In 1962, science fiction’s shining stars foresaw many new frontiers which humans would be exploring in the years to come—in space, in the depths of our own oceans, even within our own genetic structure. Now we can look back at the very best of these stories and see just how far we have come along these pathways to the future and how much of the journey still lies ahead. The "Great SF Stories" series underwent a number of changes to the cover over the course of its publication, but this is the first volume in which the internal structure altered. The twenty-three previous volumes all contained an introduction talking about the year in general, both in terms of the wide world and the world of sf itself. 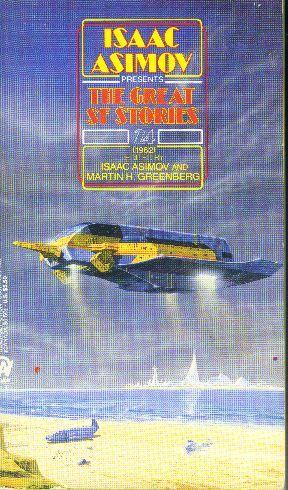 Then follow the stories in chronological order of publication, and each story has two headnotes: one by Greenberg talking about the story and author, and one by Asimov giving a more personal perspective on the story or its theme. Unfortunately, Asimov was unable to complete his headnotes for this volume before his death, which makes this a rather melancholy volume for me. In addition, there are no stories by him in the volume: the only choices would have been “My Son, the Physicist” and “Star Light,” neither all that good. Add to it the fact that none of the stories are stand-outs for me, and it becomes a real disappointment indeed.